Maybe Tied to Organizational Culture? Do you have a good sense of your organization’s culture? What sets your employer apart from other employers within your community? Are you consciously (and sub-consciously) making behavioral choices that reflect the essence of what your employer represents to its employees, customers, community and to the general public? In its purest form, an organization’s ‘culture’ represents the collective values, beliefs and principals of its members – a product of many factors that include history, market, product, technology, type of employees, management style and environmental impacts from the community in which it operates. In other words, an organization’s culture represents the ‘DNA’ or identity that is unique to each employer. Why is this important? Because it’s fascinating stuff! Allow me to explain. 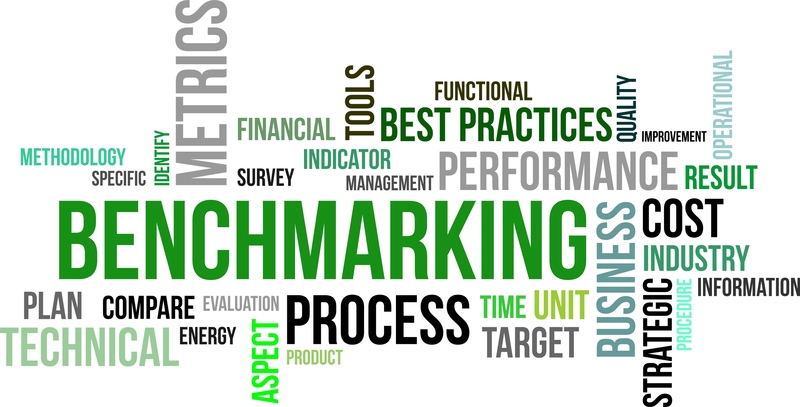 Our Lindex Online Benchmarking® program allows Iowa employers to compare their benefits package to employers of similar size, industry and location. Upon completing an online questionnaire on a vast array of benefits and insurance options an employer offers at their workplace, the employer receives a report comparing their benefit offerings to those who responded in the most current Iowa Employer Benefits Study©. This report produces a great deal of comparative information about many key benefits that are highly-desired by employees – including health and dental insurance, group life and disability coverages, retirement plans, sick leave and vacation, among others. So with all of this benchmark information being compared and shared with the employer, how does an organization know if their plan offering is competitive? Easy! All information is distilled into one simple number – the Iowa Lindex score®. The Lindex score is a complex algorithm that distills voluminous and complicated data into one relevant number between 0 and 100, providing clarity on just how competitive an employer’s benefits package is to other employers within Iowa. Lindex measures the availability, costs and use of many key benefits. This score is compared to the overall average Lindex score calculated for those who responded to the most recent survey. 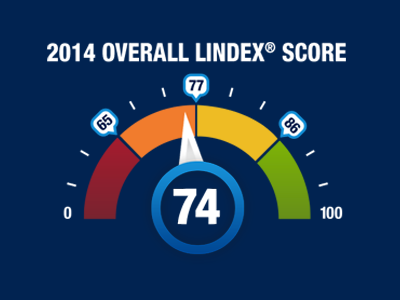 For 2014, the statewide average Lindex score was 74. The Lindex gauge below displays the quartiles of scores, with the lowest quartile ranging from 0 to 64, the second quartile being 65 to 76, third quartile being 77 to 85, and the highest quartile at 86 to 100. An employer with an average Lindex score will be around 74. As with an organization’s culture, not all employers are alike when offering employee benefits. With this in mind, once an employer learns their Lindex score, things can get quite interesting. For example, when employers score in the highest quartile (green range), their reaction can vary wildly. 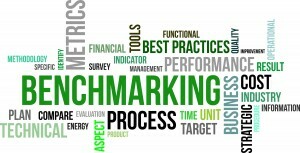 One employer may wish to tout their strong score to their employees, attributing the results to a non-biased third-party tool (Lindex). After all, employee benefits constitute about one-third of total employee compensation. But with this same high score, another employer may wish to keep this score under lock and key and strategically use this number to re-position their competitiveness at the desired mix of pay and benefits. Fundamentally, it is all about strategy – and, ultimately, their culture. There is no ‘right’ response – only the response that is ‘right’ for each organization. The culture of an organization might determine how just one number will be used when deciding important benefit issues. From my perspective, this is quite enjoyable to watch! When making workplace health-plan decisions, what type of healthcare information is desired by Iowa employers? Do employers know about web-based resources on Iowa hospitals? 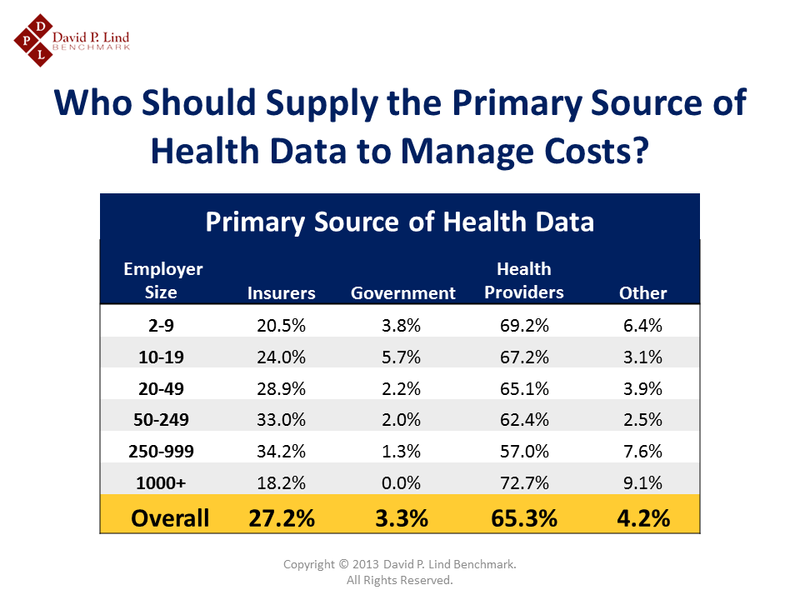 Who do employers trust to be their primary source for health-related data? We asked a series of important questions in our 2013 Study. And, you might be surprised by the results. As you might imagine, the needs and desires can vary greatly based on employer size. 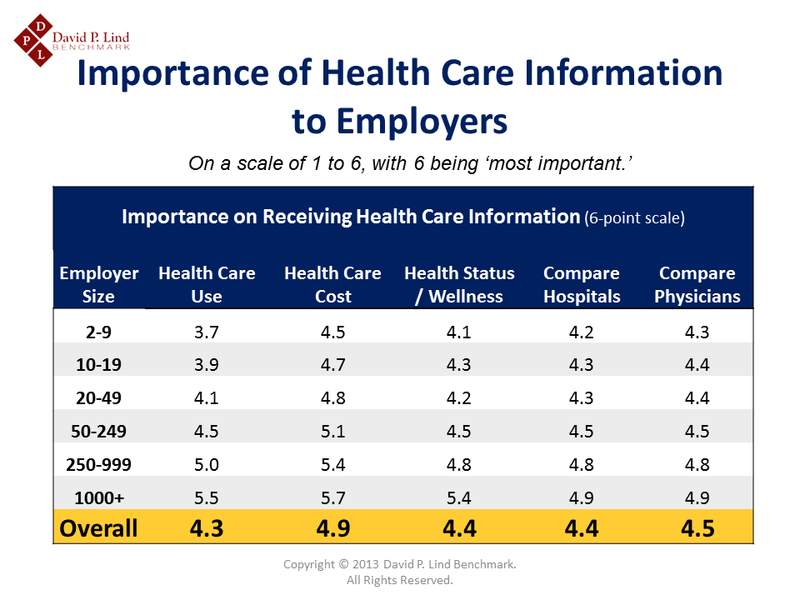 Using a 6-point scale, with 6 being ‘most important,’ Iowa employers responded that ‘Cost’ information was most important to have (4.9 score), with the largest of employers (1000+ employees) scoring this a 5.7. ‘Comparing Physicians’ followed next with an overall score of 4.5, while ‘Health Status/Wellness’ and ‘Comparing Hospitals’ both scored 4.4. Healthcare ‘Use’ finished with an overall score of 4.3. 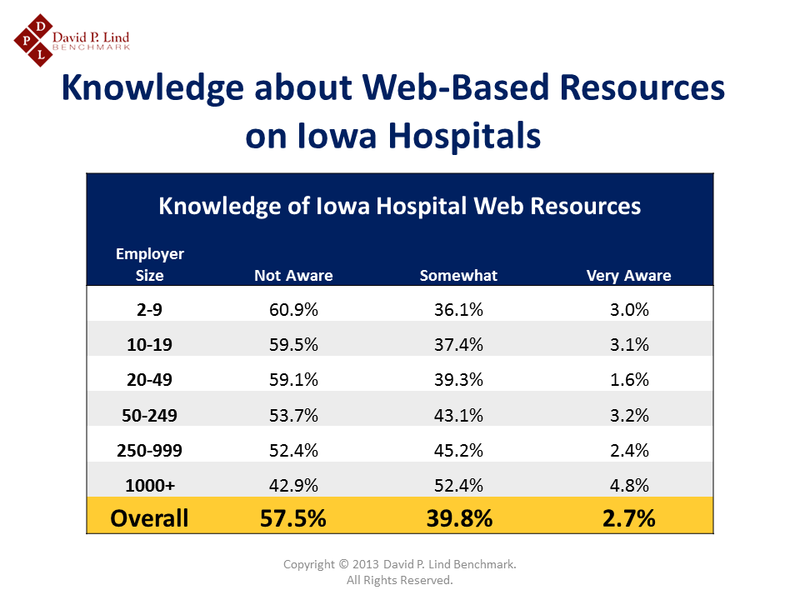 As found in the chart below, Iowa employers are unfamiliar with existing web-based resources on Iowa hospitals. Larger employers appear to be more aware of these web resources, but only a very small number of employers reported being ‘Very Aware’ of this on-line information. In case you are curious, some of this information might be found on the Iowa Hospital Association and Iowa Healthcare Collaborative websites. As mentioned earlier, ‘cost’ information appears to be most desired, followed by comparing physicians and hospitals, presumably on quality-related metrics. When employers responded to how optimistic they are on the effectiveness of ‘Medical Homes’ and ‘Chronic Disease Management Programs,’ employers with over 1000 employees were at least twice as likely to be optimistic (43 percent) than smaller employers with under 250 employees. 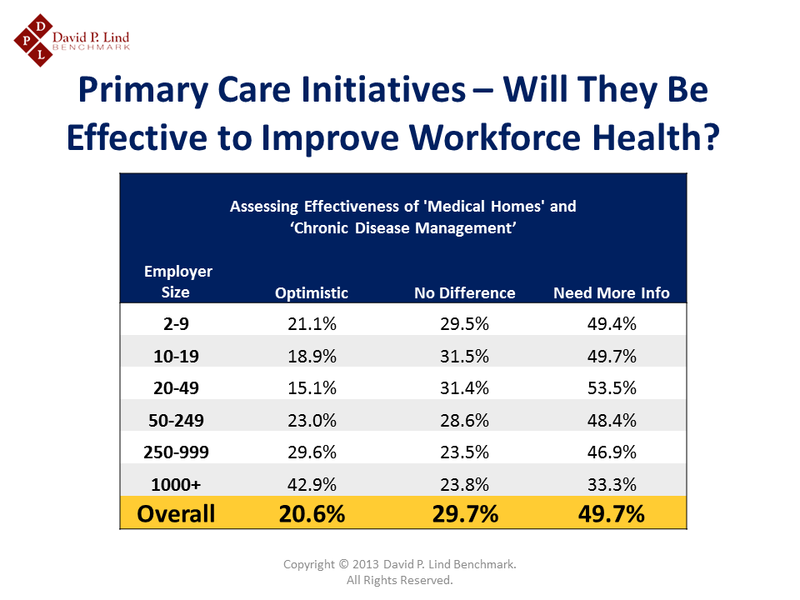 Overall, only 21 percent felt optimistic about these initiatives being effective to improve workforce health. Another 30 percent were not that optimistic and responded that such initiatives will make ‘No Difference.’ Half of all employers indicated that they would need to have more information on both programs before making judgments as to the effectiveness of health improvement. So, if organizations desire critical information to make future decisions on workforce health, it begs the question who they desire to be the primary source of this information. This question elicits some very interesting results. Overall, 27 percent of Iowa employers desire insurance companies to be the primary source of health information. Yet interestingly, the largest employers with 1000+ employees were less likely to desire insurance carriers to be the primary source – only 18 percent voiced their interest. Only three percent of organizations desired the government to be the primary source of health information, which speaks volumes about their lack of appetite for a single-payer system. The preponderance of organizations (two-thirds) voiced their desire for ‘Health Providers’ (hospitals and physicians) to be the primary source of health information to help manage their costs. More questions will need to be asked of organizations in the future as to ‘why’ they desire health providers to be the primary source, but my initial take is simply they appear to trust this source more than other sources. The healthcare provider community may take some comfort in knowing that a majority of employers view them as a trusted resource. With this trust, however, comes the responsibility to validate and enhance it by providing a greater array of transparent information on costs and delivering higher-quality outcomes. From our 2014 Study, we know that employers expect to receive reasonable costs, consistent quality of care and safe care that is appropriately delivered to patients. This type of feedback for insurance companies is most assuredly humbling. 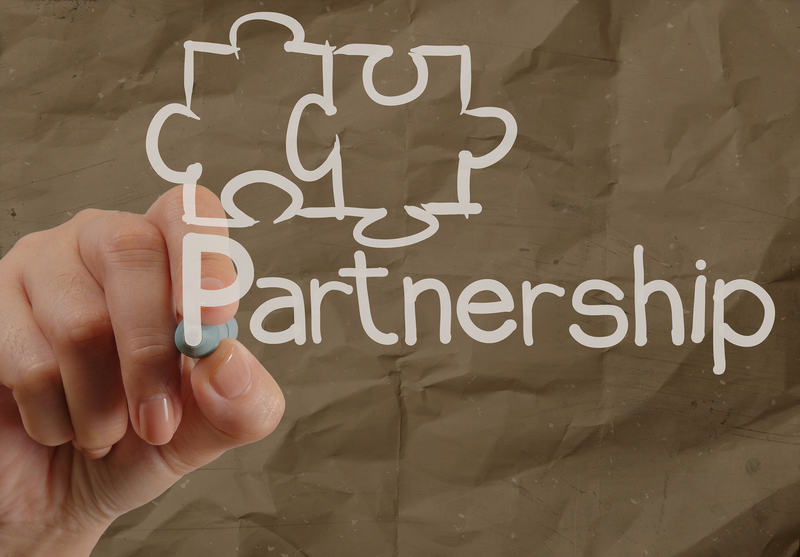 Yet, it should also re-awaken the pursuit of new initiatives to make inroads on gaining a trust-related partnership with their clients. The silver lining for both health providers and insurance companies reveals lots of room for improvement – and immense opportunities. But opportunities can only happen if relentlessly – and thoughtfully – pursued. 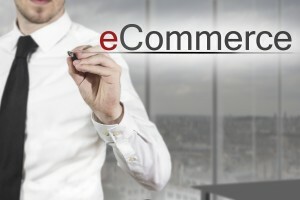 Trust is the currency of commerce. In our healthcare world, we can always use more of it. Exchanges basically come in two varieties – private and public. 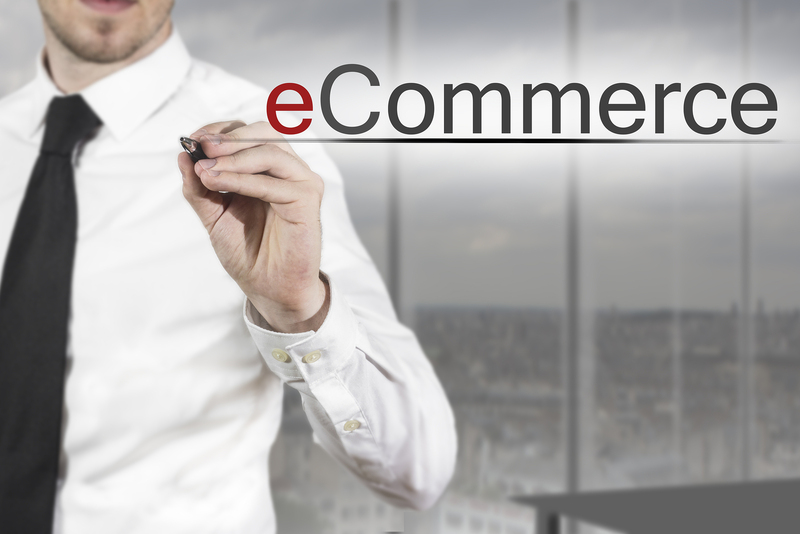 Private exchanges are established by benefit consultants, insurance companies and other third party vendors. Under the auspices of the Affordable Care Act (ACA), public exchanges were implemented to allow qualified individuals to receive premium subsidies from the federal government. In addition, small businesses with fewer than 25 full-time equivalent employees may be eligible for premium tax credits depending on the average wages paid to employees. Iowa has a hybrid public exchange – which is a joint federal/state arrangement. 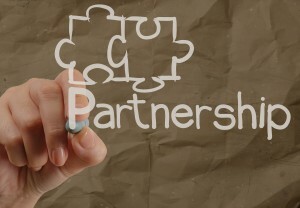 Also known as a ‘partnership’ exchange, it is similar to the federal public exchange, whereby subsidies and small business tax credits are available for qualifying individuals and businesses. As we all know, the primary concern for employers who offer health insurance is COST. Cost drives behaviors for both employers and their employees, resulting in health plan alterations that can help alleviate (but not solve) annual premium jumps. Usually plan design changes come in the form of elevated deductibles, copayments, out-of-pocket maximums and employee contributions. Such behaviors result in shifting costs to others but does not address the fundamental issues that adversely impact health costs. Inevitably, questions arise about the growth of exchanges and how they may eventually contain costs. 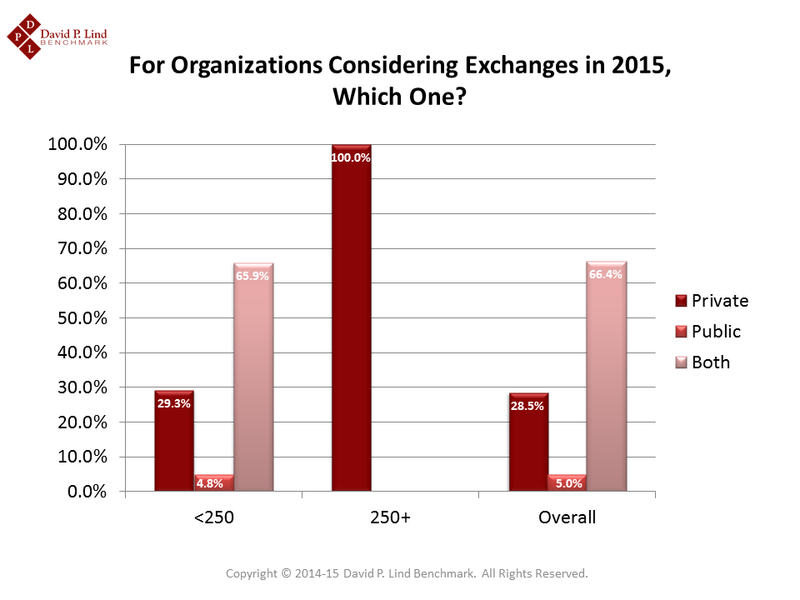 Will employers embrace the exchanges here in Iowa and elsewhere? Can annual premium increases be tempered due to the eventual ascension of exchanges, both private and public? Without a doubt, many questions surface as to whether exchanges can and will make a difference with cost. Yet, the waters remain turbulent and uncertain for the foreseeable future. 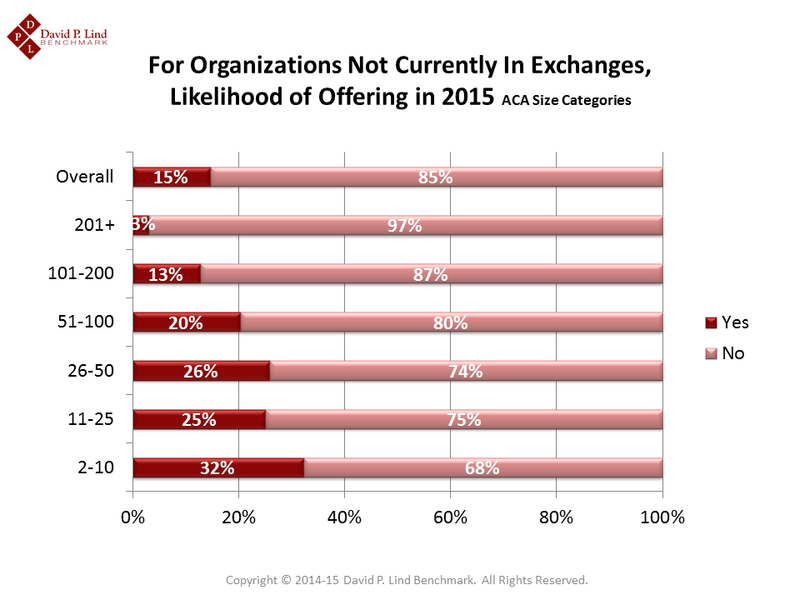 Within our 2014 Study, we did ask employers about their intentions to offer health coverage through a private or public exchange in 2015. From this, we learned that 15 percent of Iowa employers appear interested in exchanges for 2015, with almost 21 percent coming from employers with fewer than 250 employees. Based on organizational size, the smallest employers appear more likely to embrace participation in exchanges, as 32 percent of employers with 2 – 10 employees indicated interest. 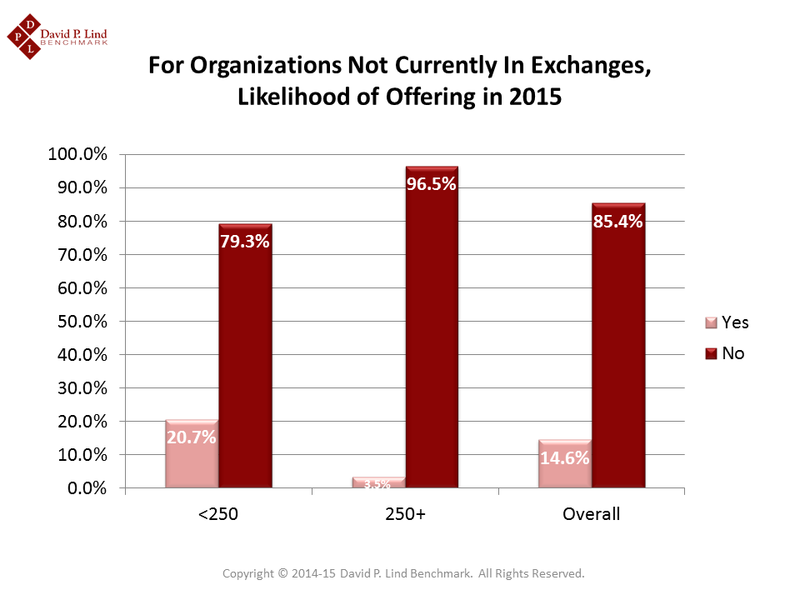 While only three percent of employers with 201+ employees show interest in exchanges for 2015. Of those 15 percent of employers interested in exchanges, about 29 percent (coming only from organizations with under 250 employees) responded that their preference would be to explore only private exchanges, while five percent indicated they would consider public exchanges. Two-thirds (66 percent) of employers who have interest in exchanges responded to having interest in both the private and public exchanges. Will exchanges make a great impact to the cost problem confronted by individuals and employers? My simple answer is no, employers should avoid having high expectations that electronic marketplaces will somehow control health costs. This would be pure delusions of grandeur. Expecting exchanges to control costs is nothing more than rearranging chairs on the Titanic – it may feel like progress is being made, but the bow of the ship has a gaping hole that requires immediate attention. The gaping hole that I am referring to is a dysfunctional healthcare system and unhealthy lifestyles. Make no mistake, merely shifting costs to employees should not be confused with controlling costs. Health exchanges may likely be beneficial in other areas for employers and their employees, just not in controlling health costs. Let’s first fix that hole.